The Canning Doctor: Going Too Far? Nah! 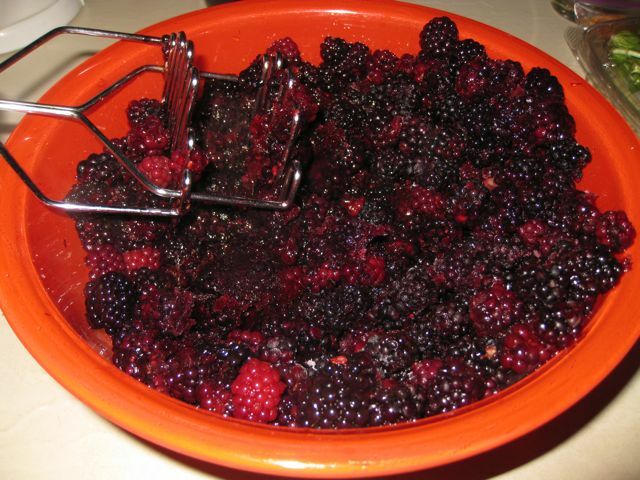 Gleefully I crowed to my sister about picking 2 quarts of wild blackberries in our brother's backyard yesterday. She said, "You realize you're crazy, right? I've never seen anyone get so excited about foraging." I just can't help myself! Even if I did have to arm myself with gardening gloves, hiking boots, and long pants just so I wouldn't get so many scratches. I mean, I was IN those bushes. I did, at one point, get stuck under a very large and spiky cane and required my sister-in-law's assistance to get out. At which point, I'm quite sure, SHE decided I was crazy, too. Today's batch is wild blackberry. I even ran 1 quart of the berries through a sieve to get out some of the seeds. It smells heavenly. I decided not to add the sage; I'd been debating this all week, but finally "simple" won. Using the basic recipe in the Certo package, I ended up with 8.5 cups of jam. I'll keep 4 cups and the other 4.5 will go back to my brother and sister-in-law. I love, love, love blackberry picking. Even the scratches don't bother me so much. I like to think of foraging as accepting earth's amazing gifts. The Sure-Jell Less Sugar recipe is my favorite. Just sweet enough with lots of blackberry flavor. Yum. Unfortunately, a few of them didn't seal. I caught 3 of them, and replaced the lids and reprocessed; they sealed fine. This morning I discovered the 4th didn't seal, so it's in the fridge for us to eat now. That'll teach me to use old lids! There may be a fine line between being 'crazy' and being passionate about something...but I like to call it passion instead. :-) I love Jeanine's comment "I think half the happiness is in the journey." I totally agree!